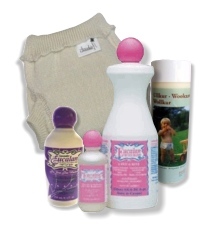 How and why do I lanolize wool diaper covers? After choosing a diaper cover that meets your baby or toddler's needs, you will need to know how to properly care for that cover. If your diaper cover is a wool cover, this will involve lanolizing the cover from time to time to maintain its water resistance. Wool diaper covers have almost superhero properties. They have natural odor fighting agents and can be air dried for weeks before needing to be washed (unless they get soiled). However, the amazing properties of wool owe more to the lanolin in the wool than the wool itself. So, to preserve the life and durability of the wool cover, you should lanolize wool covers on a regular basis. Before you lanolize wool, you may want to wash it by putting the wool cover in the sink or a pan to soak in lukewarm water. Add 1/2 tsp of baby shampoo or lanolin enriched Eucalan to the water before soaking to gently cleanse the cover. While it is soaking, place 1/4 tsp of lanolin into 1/2 cup water and either microwave together or boil together on the stove. When the lanolin is melted, add it to the soaking cover. Stir to ensure it is all mixed. The wool cover can soak anywhere from 15 minutes to a few hours giving it a chance to absorb the lanolin. Once it is time to dry the cover, avoid wringing or squeezing the material as this can cause it to become misshapen. Instead, lay the cover inside a clean, dry towel and roll it to remove excess water. Then, lay the cover flat to dry and you should be back in business. If the extra steps to lanolizing wool covers seems like more work than you would prefer, you may want to review other fabric choices and diaper cover styles by reading, How Do I Pick the Right Diaper Covers?.